Ladies and Gentlemen... good afternoon. I would like to thank you very much for joining us this afternoon. Welcome to VC Bird International airport to mark this special occasion as we mark and celebrate the birthday of the Father of the nation. Today is a wonderful day as we welcome our Caribbean brothers and sisters at interCaribbean to our new, wonderful VC Bird International airport with regularly scheduled service from not only Santo Domingo Airport but to Terrance B. Lettsome International Airport in the British Virgin Islands with service between both destinations. This new service is incredibly exciting for Antigua and Barbuda and our new VC Bird International airport as it further strengthens our position as an aviation hub in the Caribbean. Antigua is now also in the perfect position to offer visitors and residents one-stop connections to the Bahamas, Panama, Cuba, Jamaica and their home base in the Turks and Caicos Islands by partnering with interCaribbean Airways. Airlift is integral, not only to the success of our tourism industry, but to our investment and growth strategy as a nation. Increasing our annual passenger traffic exponentially year over year is a critical part of this. So, thank you interCarribean for playing a significant role in this growth. Not only do they bring with them a vast network – they offer more flights within the islands of the Northern Caribbean than any other airline, but they also have Interline agreements with airlines such as British Airways meaning customers connecting between the two airlines are flying on a single ticket purchase. This makes travel not only much smoother and more ideal for the passengers, but it increases the visibility of the flights through the different booking platforms. Additionally, the flight from Santo Domingo, the second busiest airport in the Dominican Republic that handles more than 3 million passengers annually, opens up traffic from around the world with countries in Latin America and Eastern Europe that Antigua currently does not have direct flight from. This means that same day connections are now possible from mainland and Eastern Europe, and Antigua will also be an ideal connection for traffic further on to the British Virgin Islands. We also expect these flights to be warmly received by both the people of Antigua and Barbuda as it opens new options for their own travel, as well as the thousands of Caribbean brothers and sisters from the Dominican Republic and the British Virgin Islands who reside here. New airlift means more options for flights and therefore more opportunities for growth in air traffic between the Dominican Republic and Antigua and Barbuda. Just a few short months ago we had the absolute honor and pleasure of opening of the new terminal, here, at VC Bird International airport. We are proud to be able to say that we are the newest and most modern airport in the Caribbean – offering a vast portfolio of services, technology and amenities that cannot be found throughout the region. To summarize very briefly for those who may be first time visitors, this includes free Wi-Fi, the latest in check-in technology at the kiosks, expedited customs for both arrival and departure, a full range of dining and shopping options including multiple duty-free stores and air-conditioning. With elevators and escalators we are also completely disabled friendly, offering a smoother and more dignified experience for those that need support in their mobility. This new terminal named for the Father of our Nation Vere Cornwall Bird became a reality for Antigua and Barbuda just 3 months ago in September. The Father of our nation was a true Caribbean integrationist in every sense of the word long before it was politically correct to hold such views. It is therefore fitting as we celebrate his birthday today that we are also celebrating the launch of this new air services to the Dominican Republic, which will serve to unite an English and Spanish speaking nation and further support the ideas of true Caribbean integration. The Father of the nation would indeed be proud of what we are commemorating today. Our new major gateway has been an added plus for our nation. We can now provide a product and service that both meets and exceeds the expectations of our hundreds of thousands of visitors each year as well as our very important airline partners. The new airport terminal has proven to be a key leverage in attracting new airlines. InterCaribbean Airways is now our third inaugural flight in just 3 short months! By the end of the month we'll have welcomed 5 new airlines, meaning we're averaging better than one inaugural flight a month, which I would suggest means we've been incredibly successful so far this year. Welcoming interCaribbean Airways to our VC Bird network is an important milestone in us achieving our goals of increasing passenger traffic, while also greatly expanding our network of direct air links. I extend heartiest congratulations to Mr. Lyndon Gardiner and his team. I welcome them with the confidence that based on their track record of growth and performance what we are celebrating today is the beginning of a long and successful partnership with interCaribbean Airways. Thank you for joining us today and once again a warm Antiguan and Barbudan welcome to our new friends and partners interCaribbean Airways. interCaribbean Airways makes its inaugural call to the Sir V.C. Bird International Airport on Sir Vere Cornwall Bird Snr. Day. (St. John's Antigua, December 9th 2015) - As nationals in Antigua and Barbuda celebrate the birthday of the Father of the nation Sir Vere Cornwall Bird Snr. today (Wed), the airport named in his honor was also abuzz with activity on the occasion of the inaugural flight of interCaribbean Airways. The new terminal at the V.C. 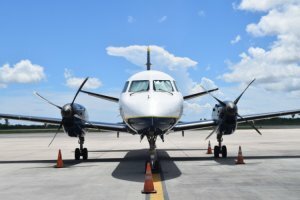 Bird International airport saw the arrival of interCaribbean Airways' new service which commences scheduled flights from Antigua to Santo Domingo's Las Américas International Airport (SDQ) and Tortola's Terrence B. Lettsome International Airport (EIS). Seats are now on sale, and bookable immediately at interCaribbean.com, by calling our reservations centers, visiting our airport locations or Customers may also visit their preferred travel agency. 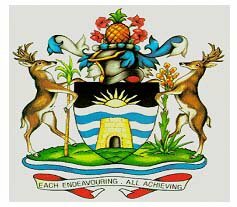 St. John's, Antigua (December 13, 2015) – Plans made by Antigua and Barbuda Tourism Officials to welcome more flights from more airlines and tour operators around the world, upon completion of one of the largest and most modern airports in the Eastern Caribbean have rapidly taken off. The Antigua and Barbuda Minister of Tourism, the Hon. Asot Michael, and Tourism Officials, welcomed a fourth airline into the destination, just three months after the opening of the new terminal at the V.C. Bird International Airport. Seaborne Airlines launched its non-stop service between their hub in San Juan's Luis Munoz Marin International Airport and Antigua today with a 34 seat Saab 340 aircraft. The inaugural flight departed San Juan at 12:45 am, and arrived into Antigua at 2:20 pm. Seaborne Airline Officials, Mr. Hector Montanez - Director of Business Development & Marketing, Ms. Susana Castro - Director of Safety and Mr. Fernando Vazquez - Director of Airports and Antigua and Barbuda Tourism Officials, Mrs. Paula Frederick-Hunte - Permanent Secretary in the Ministry of Tourism, Investment, Economic Development & Energy, and Ms. Shirlene Nibbs - Tourism Consultant for the Tourism Ministry were onboard the flight. In his remarks, during the ceremony to welcome the new carrier, Minister of Tourism, the Hon. Asot Michael called Seaborne Airlines, “the largest regional operator in the Caribbean. “The entrance of Seaborne, provides passengers with one additional option for travelling to Antigua and Barbuda, quicker and more conveniently. Seaborne's partnership with JetBlue Airways, as well as Air Europa, American Airlines, Delta Airlines, and United Airlines, means that, the aircraft can provide connections for passengers from thirty-three other destinations in the Americas as well as in Europe, into Antigua and Barbuda. “We are excited to introduce Antigua as the 17th airport served by Seaborne Airlines; the fastest growing airline in the Caribbean,” said Seaborne CEO and President Gary Foss. Flights from Antigua to San Juan depart at 3:05 pm and arrive at 4:40 pm. V.C. Bird International Airport's growing portfolio of passenger airlines maintains Antigua and Barbuda's position as a major hub in the Eastern Caribbean. Seaborne Airlines has been operating in the Caribbean for over 23 years, carrying approximately 3 million customers safely. With over 1,500 monthly departures to 17 airports, Seaborne serves San Juan's Luis Munoz Marin International Airport, St. Thomas airport and Seaplane base, St. Croix airport and Seaplane base, Anguilla, Antigua, Tortola, Dominica, Martinique, Guadeloupe, Saint Martin, St. Kitts, Nevis, La Romana, Punta Cana, and Santo Domingo. All flights operate with two pilots and two engines under Federal Air Regulation Part 121, the strictest code of the US Federal Air Regulation governing air travel.